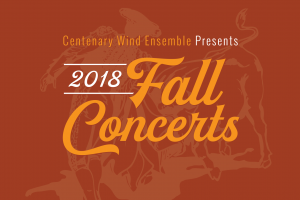 SHREVEPORT, LA — The Centenary Wind Ensemble will perform two concerts of classic works for band on the Centenary campus this fall, including a 2:30 p.m. show on Sunday, November 18, in Anderson Auditorium, and a 5:00 p.m. outdoor offering in the Hargrove Memorial Bandshell on Thursday, December 6. Both concerts are free and open to the public. A food truck from La Michoacana will be on hand for the December performance. The concert features Julius Fucik's Entrance of the Gladiators March, von Suppe's Light Cavalry Overture, music from the animated film The Incredibles, and a Mardi Gras preview, March and Procession of Bacchus. There will be two special tributes: Leonard Bernstein's Danzon in honor of Bernstein's 100th birthday, and the legendary Mexican trumpeter Rafael Mendez's spectacular La Virgen de la Macarena (The Virgin of the Arena) with Centenary faculty trumpeter Michael Scarlato. Other selections will include music by Bach, Verdi, and Khatchaturian's Armenian Dances. For more information about the Centenary Wind Ensemble concerts, contact Thomas Hundemer at thundemer@centenary.edu.